Ever since I met Gina, I have been trying to be more hip to the sustainable, green, and otherwise eco-friendly life. It is really hard right now, and it shouldn't be. 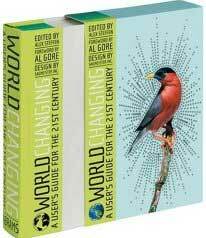 Things like An Inconvenient Truth and this brand new book Worldchanging: A User's Guide for the 21st Century are helping, and hat else can we really ask for at this point? While reading We Make Money Not Art, I heard about this book, and WorldChanging's efforts to hack the publishing system. I realize now that I'm writing this post that I was about 3 hours early. I guess it's the thought that counts. On November first, at eleven minutes after eleven a.m. (Pacific time), please go to Amazon and buy the book. Better still, go to Amazon and buy the book on the first, and in the meantime blog, email, talk up the book and do whatever you can to encourage everyone who you think cares about sustainability, innovation and social change, everyone who wants more solutions in the public debate, to join you on buying the book on 11/1 at 11:11 a.m. Please help spread the word.